Leafcutter ants ignore the frog Lithodytes lineatus when it breeds in their nests. They simply do not notice him, André Lima Barros and colleagues show, because the frog is chemically camouflaged. Ants behave aggressively against intruders in their nests, but the South American Leptodactylid frog Lithodytes lineatus isn’t molested. In fact, he is at home in the huge colonies of leafcutter ants. Years ago, Andreas Schlüter reported that he had heard frog males calling from the interior of a leafcutter ant nest to attract females. Upon inspection of a nest, he found an adult frog within and numerous tadpoles swimming in a little pool. Obviously, the frogs breed in leafcutter nests. It is clear why they willingly live there. Adult frogs, eggs and larvae are safe from predators, for the ants prevent these from entering the nest. Moreover, the nest has an agreeable humid microclimate. But the question is why the ants, eager to evict all intruders from their nests, do tolerate these animals. Now, André de Lima Barros and colleagues show that the frogs are chemically camouflaged. In their skin, they synthesize compounds which apparently imitate the odours with which the ants communicate. 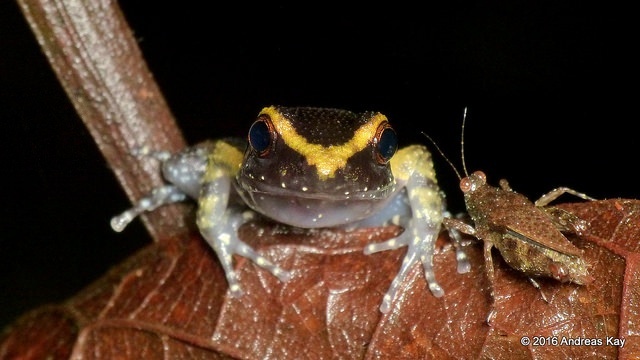 Since the ants rely on odour perception, the frogs go unnoticed: a good example of mimicry. The researchers placed frogs of different species close to a nest entrance. When the experimental frog was a Lithodytes lineatus, the ants never attacked, but when it belonged to another species – either a species that is closely related to Lithodytes lineatus or a species that looks exactly the same as this frog – the ants became aggressive and bit the unwanted guest, that tried to escape quickly. Next, the biologists prepared an extract from the skin of Lithodytes lineatus and coated a frog with it that normally would be chased away by the ants. Impregnated with skin extract of Lithodytes lineatus, the frog elicited no response. So, Lithodytes lineatus can enter a leafcutter nest unharmed thanks to chemical camouflage. The uninvited guest is not a burden to the ants whatsoever, as he doesn’t touch the ants nor their brood. As he eats all sorts of other critters, such as assassin bugs and crickets, he may help the ants to keep the nest free of such enemies, in return for a safe place to breed. Schlüter, A., P. & K. Löttker Mebert, 2009. Use of an active nest of the leaf cutter ant Atta cephalotes (Hymenoptera: Formicidae) as a breeding site of Lithodytes lineatus (Anura: Leptodactylidae). Herpetology Notes 2: 101-105. Next PostNext Who is the prey?